In 1915 the Womens’ Institute set out to give women a voice, to be a force for good in the community. A trusted place for women, run by women of all generations – an opportunity to share experiences, challenge yourself or learn from someone with real experience, first hand. For many, the WI is an opportunity to share knowledge and learn new skills with other women, coming together socially where you will be listened to and be heard. Whether it’s Family History, Spring Cookery, Experiences of a Himalayan trip or Poetry & Plonk there’s an interest for everyone and always something new to learn. Some join to campaign; the WI has a voice on the issues of today, from climate change to children’s diet, from human trafficking to supermarket expansion. And it’s a voice people really listen to. For everyone who joins the WI there is the freedom to make what you want of it. Whatever you choose, the WI promises to be a source of friendship, inspiration and enjoyment. Asby WI meet regularly on the second Tuesday of the month (except January) at 7.30pm in Great Asby Village Hall. There is a speaker, activity or demonstration and the chance to chat over a cup of tea. See the Diary of Future Events opposite for further details of our current programme. We also organise occasional outings and visits and there is the opportunity to join other WI’s in the local area at their events. Below you can also read the reports of our most recent meetings. Asby WI instigated a Knit & Natter (craft) group who meet on the first and third Mondays of the month in members’ homes. Bring your own craft to do, perhaps knit squares for blankets, or just come along for coffee and a chat. WI members and non-members are all very welcome. We meet at 2pm. The dates and venues are published on the ‘What’s On’ Calendar on the front page of this website and in “Asby Matters”. 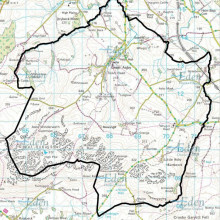 The WI is arranged into Federations; Asby WI is part of Cumbria Westmorland Federation of WIs (CWFWI). You can find lots more information about them at their web site. We all receive a monthly newsletter, “WI News”, from them with details of lots of events in our area. You can check their 2017 Diary of Events. The National Federation of Women’s Institutes represents all the WIs in England, Wales and offshore islands. Your annual subscription includes 8 copies per year of a glossy magazine, “WI Life”, which is delivered directly to every member. Lots more information about the WI nationally is available at their web site. Vice President – Pat Bevan. or just come along to a meeting, you will be made most welcome. Read our Annual Report for 2018. 'My Mum doesn't work. She's a teacher.' was one of many anecdotes that the Rev Canon Carole Marsden quoted when she visited Asby WI to give her talk 'Is it true, Miss?'. The previous month Mrs Marsden had had to cancel her visit at the last minute because of flooded roads. However, members, knowing how entertaining a speaker she is, were delighted that she was able to stand in at short notice when another's booking fell through. In her talk Carole described her time as a Primary School teacher in less affluent parts of Lancashire. Her talk was interspersed with short poems about the characters and events involved in the school year: people such as the dinner lady and the caretaker. Events highlighted by anecdotes were parents' evenings, school assemblies, children choosing team members, parents' letters, and the visits of Nitty Nora! Children's news books were also a source of entertainment. Asby WI celebrated the first month of the year by enjoying a delicious festive meal at Mrs Miller's, Culgaith. Committee member Carol Smith was responsible for the arrangements which included making sure members' dietary requirements were all met. As on a previous occasion the meal was very well received indeed. February's meeting was a hands-on, practical evening led by Louise Reeve (Committee member) with Annie Johnson (President) helping. 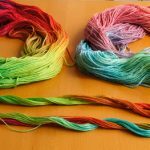 They introduced the WI to the craft of rainbow dyeing. Each member chose between working with a 100 gram hank of white Aran or darker Gottland wool and up to three dyes from a wide range of colours. Asby WI was the host for the Crossfell Group's half-yearly meeting. Asby's President, Annie Johnson, opened the meeting by welcoming 40 members from Asby, Bolton, Colby, Ormside and Kirkby Thore WIs, and the CWFWI Treasurer. Following a short business meeting Annie then introduced the evening's speaker - Mr Archie Workman. The title of his extremely interesting and entertaining talk was 'My life in the gutter'. In it he described how he had begun his professional life as an engineer working initially on ships' diesel engines and later supervising work in the dry docks. Work then took him to Russia for 2 years after which he returned to Cumbria and spent time on Cumbrian development, finishing as the part-time Managing Director of Ulverston Business Centre. Note: To access ALL the meeting reports from the last 12 months just choose to read the full version of any of those above, then select from the list of past meetings. ASBY WI invite you to indulge in... 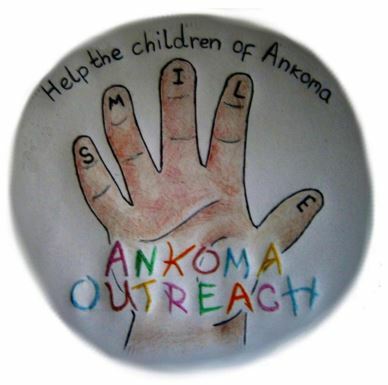 Traditional Afternoon Tea in the Village Hall In aid of Ankoma. The Asby WI annual trip is open to everyone and this year will heading to Harrogate. 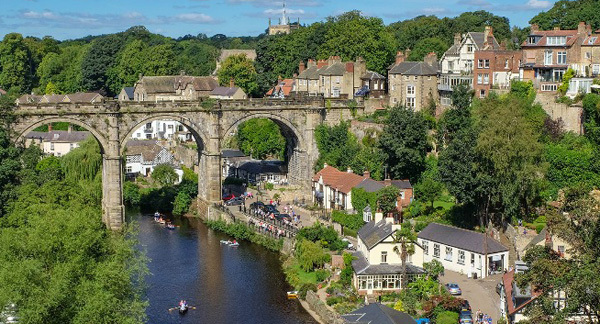 Whatever your interests you will be spoilt for choice in Yorkshire’s famous spa town. Visit the Royal Pump Room Museum, which tells the story of Harrogate’s evolution into a fashionable spa town that attracted royalty and dignitaries from across Europe. Shop in the Montpellier Quarter, which describes itself as Harrogates “exclusive shopping experience”. Keen gardeners might like to take a stroll through the Valley Gardens, or take a bus/taxi ride to the nearby RHS Garden at Harlow Carr. These should be at their best in late May. 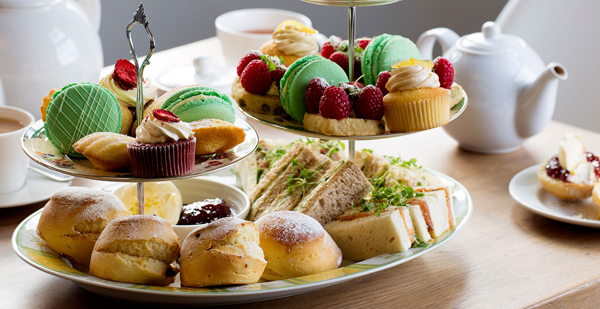 Whatever your predilection, don’t forget to round off your afternoon with a visit to the home of Bettys Tea Room, established in 1919 and probably the most visited of Harrogate’s many famous sites. For many more ideas just click on ‘Learn More’ below to go to the Visit Harrogate website. To book contact Carol Smith (017683 51668). Leaving Asby at 8:30, with a pick-up in Appleby at 8:45. Return from Harrogate at 4 pm. NOTE: The bus has to be paid for prior to the trip. So would you please pay Carol Smith or Anne Hulse before the end of April. Please make cheques payable to “Asby WI”. Thank you. A Walk in Maggie's Wood ...in the expert hands of Simon Smart.No Competition or Raffle this month. Hostesses: Maggie Johnson & Louise Reeve. …in the expert hands of Simon Smart. No Competition or Raffle this month. Hostesses: Maggie Johnson & Louise Reeve. 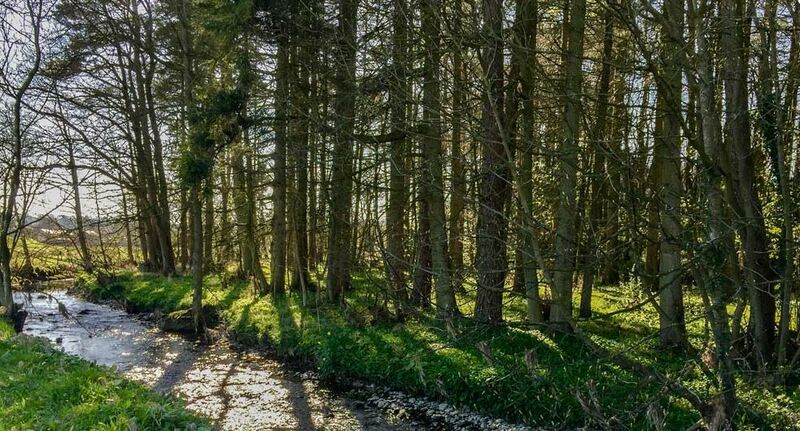 Nateby resident Debbie North has long been an avid walker of the fells and dales. 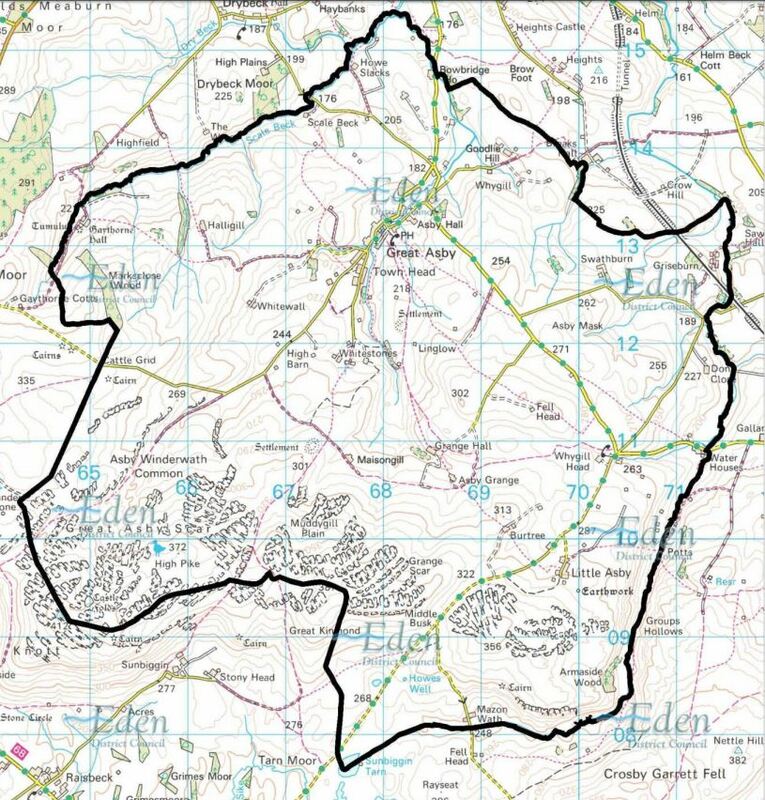 When she became confined to a wheelchair it looked as if her hill walking days were over. Well, if you think that, then you definitely don’t know Debbie! 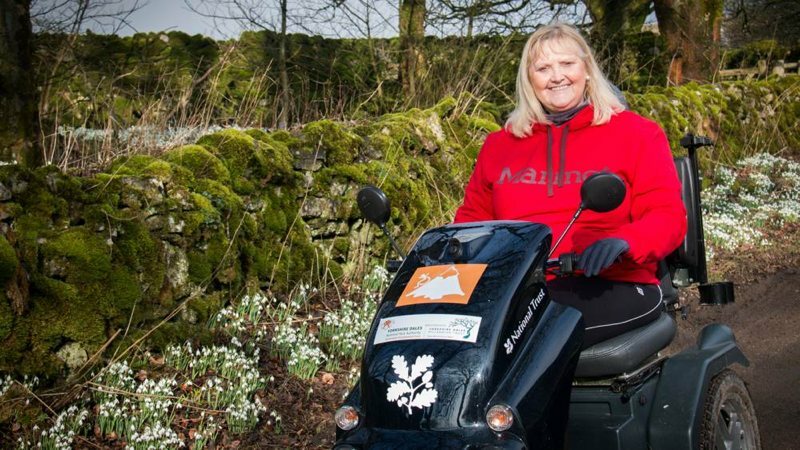 In 2015 Debbie and her husband, Andy, completed a Coast to Coast Journey from St Bees to Robin Hoods Bay using a 4×4 all terrain wheelchair called a TerrainHopper. 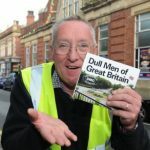 The adventure created a lot of media attention, resulted in a book ‘In the Spirit of Wainwright‘, and spurred Debbie on to advance her efforts to increase accessibility to our glorious countryside. Hostesses: Jackie Lambert & Julie Docker. Orton and Dolls' Houses ...with Jackie Huck.No Competition or Raffle this month. Judy will discuss her time serving with the charity ‘Mercy Ships’. Click on ‘Learn more’ below for more on this charity. Hostesses: Susan Renshaw & Helen Horn. Book Covering Speaker: Irene Nelson. Competition: An interesting book cover.Hostesses: Pam Cowey & Susan Walker.Raffle: Anne Hulse. Competition: An interesting book cover. Hostesses: Pam Cowey & Susan Walker. Asby WI members are again collecting your surplus items to support ‘The Pride of Cumbria’ Air Ambulance. Clothing, Bedding & towels, Curtains, Shoes (in pairs, please! ), Belts & Handbags. Mobile phones (working or not), used Printer Ink & Toner cartridges (in separate bags from clothing, please). Rags are also welcome, but in separate bags marked ‘Rags’. Please deliver to Asby Village Hall between 8 am & 12 noon. The charity Great North Air Ambulance is called into action around one thousand times every year. In 2014/15, they treated 869 patients. When a 999 call is made, it is handled by the local ambulance service. In Yorkshire, the North-West and Scotland, ambulance service call centre staff are trained to request GNAAS over the phone if needed. Annual Meeting & Activity Competition: A handmade Christmas card.Hostesses: Barbara Askew & Maud Holder. Raffle: Annie JohnsonrtAll welcome! Competition: A handmade Christmas card. Hostesses: Barbara Askew & Maud Holder. "Christmas Wreath Making" Speaker: Louise ReeveLouise will demonstrate how to make you own wreath, just in time for the festive season.Competition: "A Christmas Table Decoration"Hostesses: Pat Bevan & Rachel Forrester Raffle: Jackie LambertAll welcome! Louise will demonstrate how to make you own wreath, just in time for the festive season.